Posted on October 14, 2015 at 5:04 am. The Hall of Gods progressive has just surpassed $AUD 8.5 million and counting, so head to Thrills Casino for your chance at becoming the next millionaire. Often overshadowed by Net Entertainment’s most popular progressive, Mega Fortune, you’d be forgiven if you weren’t aware of the mythological themed jackpot slot, Hall of Gods. There are three jackpots to Hall of Gods, and at the time of writing the mini stands at $AUD1563.62 and counting, the Midi stands at $AUD140,644.92 and counting, and most importantly the Mega jackpot stands at $AUD8,570,220 and counting. 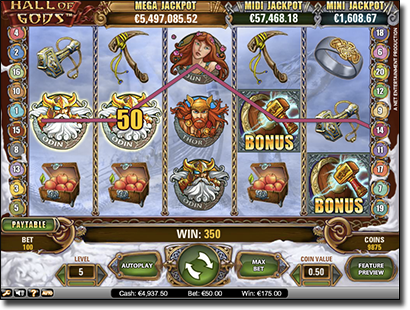 With a standard video slot format of 20 paylines across 5 reels, we see Norse Mythology come to life on this progressive, but there is more than just the three jackpots on offer. The minimum bet is $0.20 and the maximum bet is $50. While you do not have to be playing the maximum bet the paytable states that you increase the chances of hitting the jackpot by playing big, so we recommend doing so. The Midgard Serpent acts as the Wild symbol and expands when appearing on reels 2, 3, and/or 4, while the Scatter symbol is the Grave Ravens, with three of these triggering 10 free spins, four triggering 15 free spins, and five triggering 20 free spins. The free spins all have a 3x multiplier applied too. However, the most important symbol is Thor’s Hammer. Spin three of these Bonus symbols to activate the Bonus Feature where all symbols turn into shields. You are required to smash these to reveal a prize, which will either be cash or one of the jackpots, provided you’ve matched three of the same. Interestingly, the average amount that the Mega jackpot has paid is $AUD8.8 million, and what’s more is that the average time between the jackpots going off is 28 weeks, and 25 weeks ago the Mega jackpot was won by an anonymous player of the amount $AUD12,312,048 -so now is the time to get playing the progressive. Additionally, Thrills online casino has had regular big wins at their site including a player by the name of Mika who won $225,000 on Twin Spin, as well as another player by the name Johan who won $135,000 on Gonzo’s Quest, both this year. So if you want to be the next millionaire thanks to NetEnt’s Hall of Gods head to Thrills online casino now and get spinning. We recommend heading to Thrills Casino to play and if you are a new player, take advantage of the $500 in matched deposits and 50 free spins on NetEnt’s popular slot, Starburst.